If your windows could speak, they would probably have a lot of stories to tell. Original windows may have lived through multiple generations or families, and many windows have seen harsh storms and hot, relentless summers. As time passes, paint might chip, hardware can become tarnished and you may see dirt that accumulates in areas like weatherstripping or in and around your window screens. Some wear and tear is normal and usually won’t affect the performance of your windows, but other signs indicate that window replacement might be on the horizon. Here, we take you from “in the clear” to “seek immediate attention” by breaking down symptoms and what they might mean for your home’s window health. You might be seeing condensation on your windows, especially when temps outside have dropped. This is perfectly normal, and simply means the temperature inside your home is warmer than outside. Condensation can even be a sign of effectively sealed windows and doors, because it means the warm air is staying inside your home. Minor cosmetic damage like chipped paint, tarnished hardware and dirty weather stripping simply need proper care and maintenance, and do not indicate a need for replacement. Difficulty opening or closing your windows or doors, sashes that stick or other pesky operational issues can sometimes be solved with a thorough cleaning or small repair. You should keep in mind, however, that these problems can also tell you that there are components in your windows that may be nearing the end of their lifespan. It might be a good time to have someone out to take a look. Drafts or inconsistent temperatures throughout your home can be unpleasant, and they also are a sign that replacement windows might help with efficiency and overall comfort. If the time isn’t right to make the investment, earmark replacement for the near future. Windows and doors are entry points for your home, and broken windows and doors should be addressed immediately. As you’re making your choices for window replacement, you can consider whether additional steps toward a safe and secure home, such as the Marvin Lock Status Sensor, would help provide peace of mind in connecting your windows and doors to your automated security system or app. Moisture between your glass panes, excessive frosting, leaking, water stains or evidence of wood rot can be serious signs that excess moisture is accumulating where you cannot see it. This can lead to mold, mildew, warping or structural damage and is a common reason why homeowners opt to replace their windows. 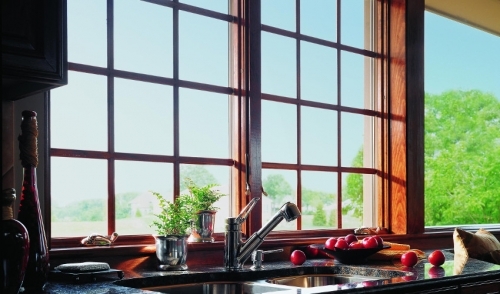 Though window replacement may not always seem like a priority, making the choice to do it right can bring benefits beyond energy efficiency and home security alone. When selling your home, new windows and doors provide an average 73 percent return on the investment you’ve made, which ranks higher than most other interior renovations. Replacement windows and doors might also offer you the opportunity to make impactful changes in your home – bring in more light, expand a window or door to frame a view or add a new architectural style or finish color. Not sure what types of windows and doors would fit best in your home? Check out our guide to the most popular types of windows and how they function.